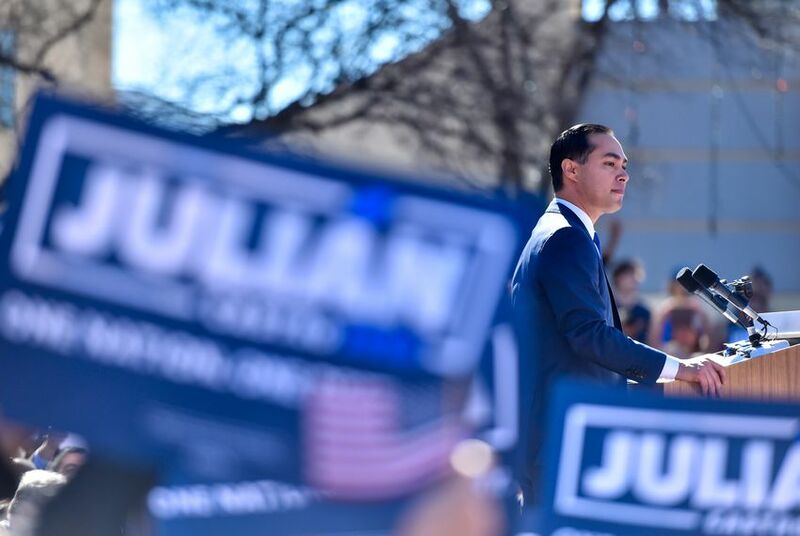 DALLAS — Just over two months into his bid for president, Julián Castro said Tuesday evening that he does “not at all” feel overshadowed by fellow Texan Beto O’Rourke amid the former El Paso congressman’s splashy presidential campaign rollout. It was Castro's first public event in his home state since O’Rourke entered the Democratic presidential primary last week, making a bigger dent in the national race than Castro managed when he officially kicked off his campaign in January. While O'Rourke spoke to a huge cheering crowd in Keene, New Hampshire, Tuesday night, Castro addressed his own packed room in a much smaller venue — a downtown Dallas restaurant. Castro said he’s not afraid of the competition — more than a dozen Democrats are now vying to take on President Donald Trump — but he knows winning won’t come easily. “I don’t start off as a frontrunner, I’m the underdog in this race. But you know what? Where I grew up, nobody grew up as a frontrunner,” Castro told a crowded group of supporters packed into a downtown Dallas restaurant. Those remarks echoed comments Castro made over the weekend in Las Vegas that were widely perceived as a swipe at O'Rourke. The dig played into a criticism that O'Rourke has had to grapple with in the opening days of his campaign: his privilege as a white man with a relatively comfortable upbringing. Campaigning Tuesday night in New Hampshire, O'Rourke declined to respond to the jab and instead praised Castro. In Dallas, meanwhile, Castro said he was getting “good traction with folks” when he campaigns in Iowa and New Hampshire. A national Emerson poll released Tuesday showed Castro at one percent support compared to O’Rourke’s 11 percent among Democratic primary voters. O’Rourke — who rose to national prominence last year after his closer-than-expected loss to U.S. Sen. Ted Cruz — drew months of speculation over whether he would throw his hat in the ring. Though he had somewhat of a rocky entrance into the presidential field last week – stories broke detailing his past connections to Republican donors and disturbing writings he produced while involved with a hacking group as a teen – O’Rourke silenced some of his critics on Monday, when he announced raising $6.1 million in the first 24 hours of his campaign, surpassing every other campaign in the race that had disclosed its first-day figures. And what’s working in Castro’s favor, some of his supporters said, is his resume. Before announcing his presidential run, the former San Antonio Mayor served as former U.S. housing secretary under President Barack Obama. Others at the event were interested in what the San Antonio Democrat could bring to the table but were not yet ready to commit.